Frankie was found lost and wandering in Merced, CA, when someone picked him up and dropped him at the shelter. Poor thing, he was a senior dog with maggots and foxtails all over his face. 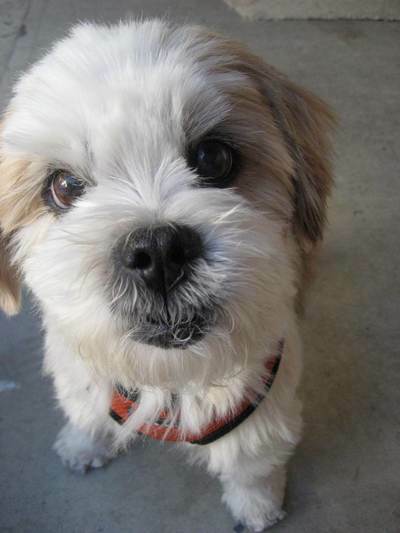 The shelter cleaned him up and contacted Muttville Senior Dog Rescue based in San Francisco. Because he had stitches in his neck from his gash, he was named Frankenstein though Frankie fits his personality much better. Frankie was fostered by a lovely family while he healed. At that time, my family was looking to adopt a dog in need and we met Muttville at an adoption event. My 9-year old son saw Frankie and said, “fluffy!” so off we went with our new little guy. This little guy has so enhanced everyone’s life. we call him Lil Gentleman in the house because he listens and he is polite. He sleeps at our feet doing the best to protect us as his Tibetan genes dictate. Everyone in the neighborhood knows the Frankster and he brings joy to many hearts as a therapy dog at The Jewish Home for the Aged in San Francisco. Dog-friendly residents’ faces light up when Frankie comes around. We thank Muttville for saving so many senior dogs that deserve a second chance!